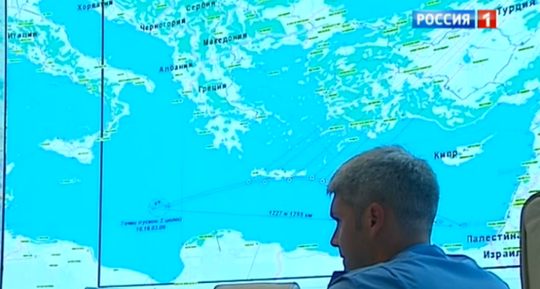 One September 3, 2013 the press service of the Ministry of Defense informed journalists that the Russian early warning system "detected a launch of two ballistic targets" in the Mediterranean Sea. The launch was detected at 10:16 MSK (06:16 UTC) by the radar station in Armavir. 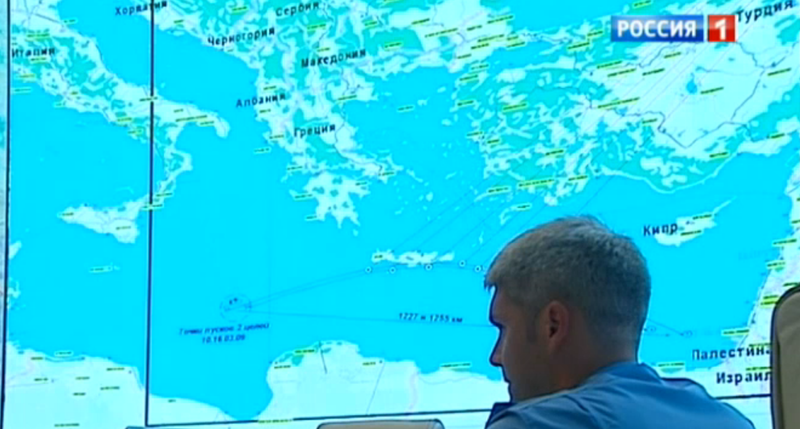 According to the information provided by the MoD, the objects were launched "in the central part of the Mediterranean Sea" toward the eastern coast. The press report also said that the minister of defense informed the president of the detection. The press report was issued some time after noon in Moscow, so the first news stories appeared around 1pm. For a couple of hours it was not clear what these ballistic objects are as no one would own up. The United States quickly denied having launched anything in the area, whether from sea or air. Eventually, Israeli ministry of defense admitted that it carried a planned test of its missile defense system, Arrow, that involved a launch of a test target - an air-launched target missile known as Silver Sparrow. The missile is reportedly designed to simulate the flight of Iranian Shihab-3 class missiles with 1,500-2,000 km range. According to Rafael, the missile developer, Silver Sparrow has a separable re-entry vehicle. It is important to note that although the missile defense test appeared to be a routine event, it was the first ever launch of Silver Sparrow - earlier tests apparently involved shorter-range Black and Blue Sparrow missiles. The September 3 test did not involve an interceptor launch - the goal was to track the target by the Super Green Pine radar and then transfer the information to the Citron Tree Battle Management Control System. It is worth noting that the U.S. Missile Defense Agency was involved in preparations for the test, although it reportedly played no role in the test itself. 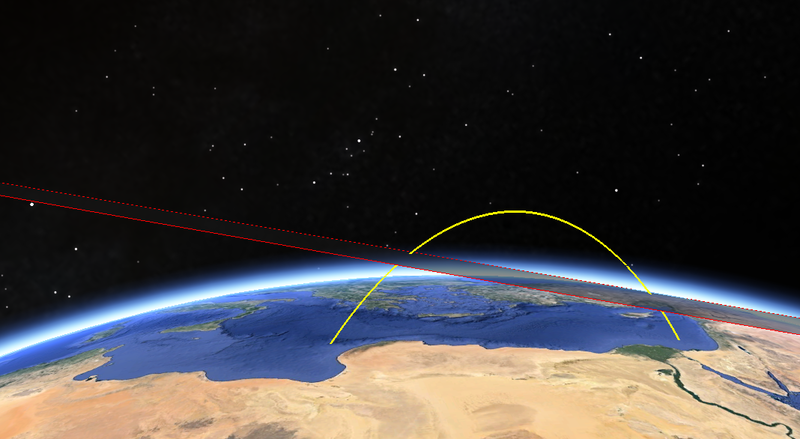 The exact location of the launch point is unknown, but about 1500-2000 km off the Israel coast does bring you close to the "central part of the Mediterranean Sea," which is about 2500 km from the Armavir radar. The distance from Armavir to Israel is about 1500 km. 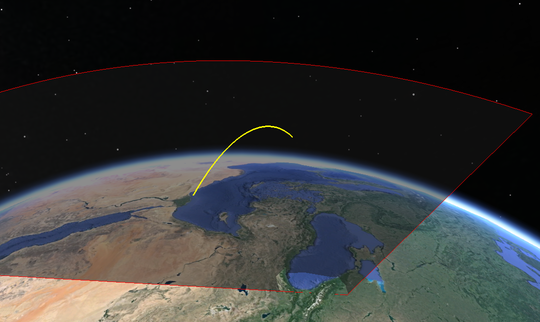 Both points are well within the area covered by one of the Armavir radars as long as the object is above 200 km or so. The flight probably took a bit over 10 minutes and for most of the flight the radar in Armavir was able to see the missile. 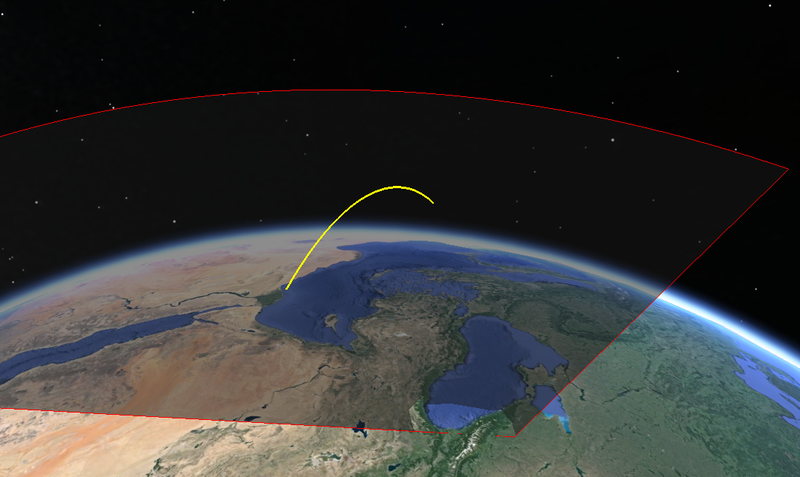 The image above shows how the visible part of the trajectory would look like from above Armavir. The one below shows the geometry from the other side. This suggests that the target missile flew along a lofted trajectory - the reported time of flight is still about 11 minutes. 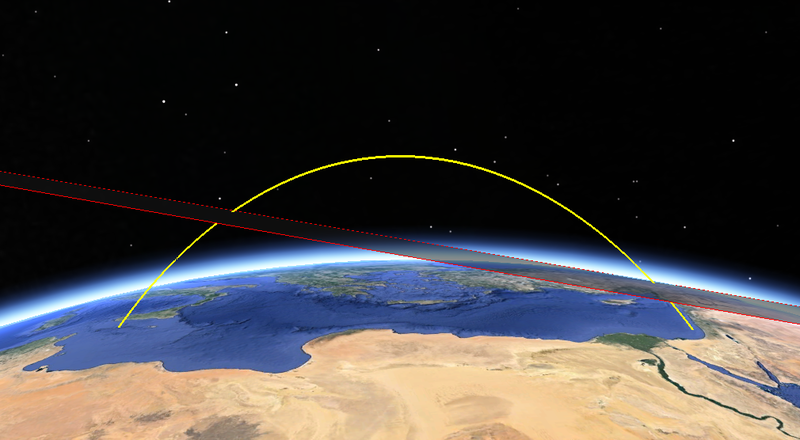 Here is a trajectory on Google Earth that is probably a bit closer to the actual one. 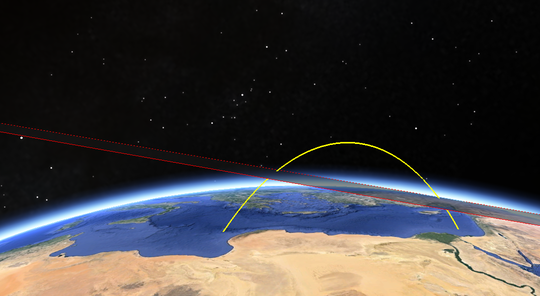 The two objects that were detected by the Russian radar are apparently the body of the missile and the re-entry vehicle that separated from the body at some point. Contrary to what quite a few people assumed, everything suggests that the military were very much in control of the situation and Russian officials knew precisely what had occurred. Indeed, it is clear that someone in Moscow even had the time to stage all the theatrics like the minister of defense's report to the president, the press release, and all that. Later in the day, Anatoly Antonov, the deputy minister of defense, said that the launch triggered the state of higher readiness at the command centers of the General Staff and the Air and Space Defense Forces. I wouldn't rule out that this statement was part of the same theater - it's hard to say now. Although it took an hour or so for the media to find out that the missile was launched by Israel, I wouldn't be surprised if the Russian military knew this all along - the flight was apparently a long-scheduled test of the system and even though Israel does not have an obligation to provide advance notification of launches like this one (or any other launches for that matter), it must have issued a standard NOTAM notification. Notifications, of course, are far from a perfect solution - one didn't quite work in 1995. Note that the 1995 incident also involved a missile launched the very first time, just as the Silver Sparrow. The incident demonstrated once again that in a complex (and tightly coupled) system that is the real world it is virtually impossible to anticipate everything and to know in advance how people would react to an unexpected turn of events. Launching missiles out of the blue is never a good idea - as we know from the 9/11 experience, there are a lot of things happening every day. And it is definitely not a good idea to launch a missile in a middle of a rather tense situation, like the one around Syria these days. But the Israeli missile defense team had no way of knowing what the situation would be on September 3rd, 2013, so they just did their job and scheduled the test. And this is exactly the problem - things could interact in completely unexpected ways. 2.- Cancel this message on 111700 UTC SEP13. 2.- Cancel this message on 081700 UTC SEP13. Does anybody check for traffic when launching missiles? 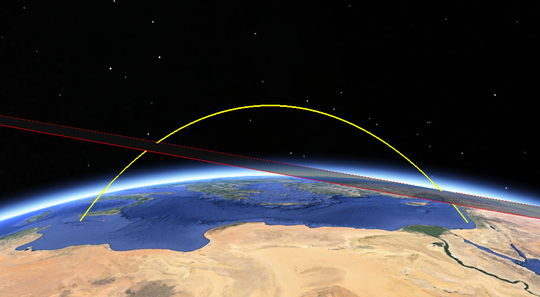 Air traffic in the vicinity would be easily detected, but what about LEO satellites? Is there one central database, or does everybody maintain their own? I'm thinking about the results of China's ASAT test.